Snapshot is a great theme for a photography showcase – so that guarantees you an awesome experience if you are a photographer or want to make an image-oriented blog or website. Snapshot is also very flexible and can be used for either a photo showcase, portfolio or design gallery and any other idea that you might have. 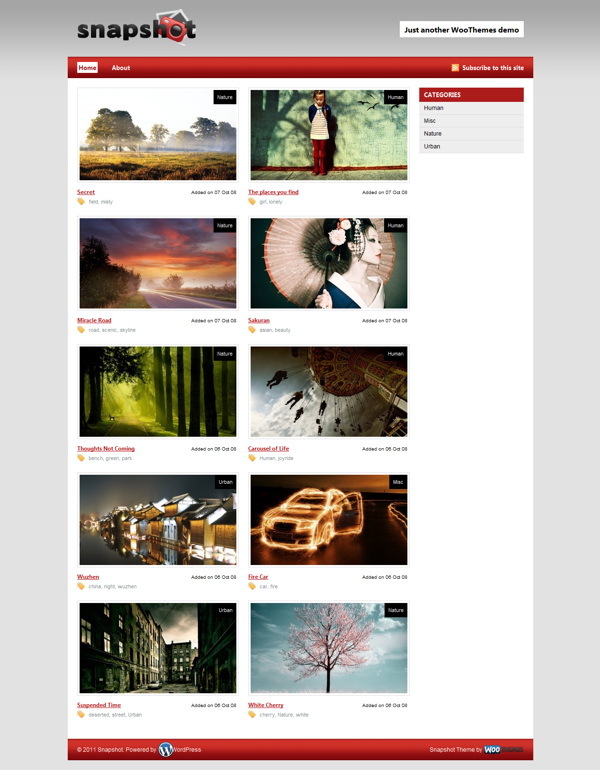 It comes with two different theme layouts / capabilities to allow you to switch between a photoblog / portfolio showcasing your own work or using Snapshot as a design gallery (ala BestWebGallery) and three unique different color schemes. Making simple changes without editing code, like adding your own logo, changing to an alternate color style, adding Google Analytics code, couldn’t be easier with the back-end theme options panel. The theme is compatible with all the modern web browsers like Firefox, Safari, Chrome and Internet Explorer. There is an image resizer script built into the theme framework to automatically scales your post images for pixel perfect display in our templates. No need to upload new cropped images when re-designing your website. It comes packaged with a .po file for easy WordPress theme translations into your desired language – editing one neat little file without hunting down text in the theme templates.